A dayhike checklist is the only way to guarantee that you're going to have a safe, enjoyable hike. If you leave things to chance and memory, you're going to disappoint (and possibly even endanger) yourself. And if you don't know what to take on a hike, making a checklist as you learn will save you lots of tro9uble. If you're in charge of planning the hike, you owe it to your trail buddies to be prepared. Let's take a look at how to make a day hike checklist. is a good dayhike checklist? The list is as long as it needs to be, given the type of dayhike you're planning. unless the weather turns bad or you get injured. Do you tackle trails that take you into the double digit mileage range with elevation gain and loss? Then don't skimp on the details. Build up a long checklist and stick to it. With every mile you put between yourself and "civilization" (or at least the trail head), you need to be more and more thoroughly prepared. If you follow your dayhike checklist, you'll be prepared no matter what you find on the trail! Every hiker needs to be prepared to either turn around, or tackle what's in front of her. Sometimes Mother Nature has nasty surprises in store that only your checklist can prepare you for. Each big category contains many options that you will need to pick and choose from, based on your hiking style and plans. If you're new to hiking, use a checklist to build an inventory of hiking equipment that you'll need to own - eventually. To start off, concentrate on safety items and comfortable hiking clothing and boots. If you've logged plenty of trail miles, use the list as a tool to quickly double check yourself before you leave for the trail head. If you're a grizzled trail veteran, use the checklist at the start of every season to review which gear needs to be replaced, repaired, or retired for the upcoming trail work. There is no "one size fits all" dayhike checklist. You're going to have to create your own version. So to get you started, here are some pages I've created to share information in each of those big categories. 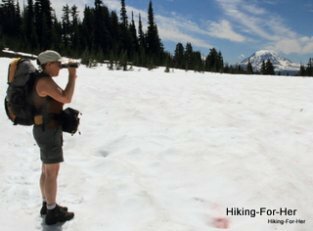 Read through the information for tips and recommendations that make sense for the type of hiking you're going to do. Start off with a general overview of what you'll need, and how to buy it. Want a specific list? Go here. Safety items: Nobody is going to take care of you out on a hiking trail, so it's up to you to be prepared. The ten essentials are a common sense list of what you need. Survival gear is also recommended. Food: There's food, and then there's hiking food. If you need gluten free trail food, get it here. If you want specific nutrition information, here it is! Water: Believe it or not, water is considered a nutrient for your body. Hiking water and hiking water bottles are 2 topics you should read about before you write "water" on your dayhike checklist. Curious about sports drinks for hikers? Read this. Fun stuff: Here's where that checklist really gets personalize! If trail time is going to be fun, you might have to bring along a few toys. Like a camera or field guides. Nothing is more fun that learning some outdoor lore: be able to identify what you spot on the hiking trail. Won't you feel better at the trail head, knowing that you have everything you need to stay safe and comfortable during a hike? I thought so! You're my kind of hiker: prepared and confident. Don't be shy about asking me questions. Use the link at the top left of this page to contact me! I'm happy to talk with newbie hikers. Too shy to ask a question? Here's more beginner hiking information to consider. The best day hike is the one that you remember for all the right reasons. Enhance your chance to dance down the trail, by using a dayhike checklist. Just for fun, let's compare notes. Here's my tried and true free dayhike checklist!